You know what’s more fun than a New Year’s Eve ball drop in Times Square? A New Year’s Eve Crab Drop on Harrison Street in Easton! 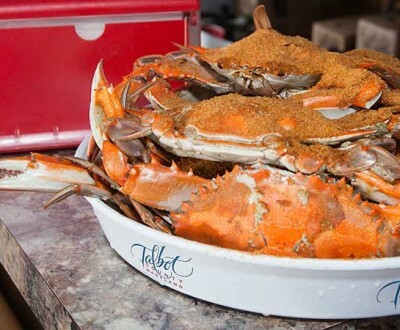 The annual First Night Talbot and Crab Drop is one of the Eastern Shore’s most popular events, where hundreds of spectators gather in Easton to watch the state’s favorite crustacean drop to celebrate the New Year. The drops happen at both 9 p.m. (for younger revelers) and midnight, and the evening also includes live music, face painting, photo booths, craft tables and more. First Night events take place in several locations in Easton including the Academy Art Museum, Avalon Theatre and Waterfowl Building (all downtown and within walking distance of one another). This ongoing New Year’s Eve tradition dates began in 1994, and news outlets like CNN have covered the crab drop live. Children love appearances by caricaturists, jugglers, fire jugglers, balloon artists, ventriloquists, magicians and more. First Night Talbot is sponsored by the Town of Easton, St. John Foundation, Carpe Diem Arts, Star Democrat and more. Admission to the venues is $8 for adults, $4 for students and kids under 5 are free. Buttons can be purchased at the Talbot County Visitors Center at 11 S. Harrison Street. Find more details on the event here.